Vice President Hamid Ansari on Monday embarked on a five-day visit to Morocco and Tunisia as part of efforts to build on diplomatic gains from the India-Africa Summit and lay platform for a future partnership. This is the first visit by an Indian Vice President in 50 years to the two nations. Ansari will be in Morocco till June 1 at the invitation of Prime Minister Abdelilah Benkirane and the two leaders would jointly launch the India-Morocco Chamber of Commerce and Industry in Rabat, the External Affairs Ministry said. During the visit, a number of MoUs will be signed in areas like education, IT and communication technology sectors, focusing on "capacity building and cultural exchange". In the second leg of his tour, Ansari will visit Tunisia from June 2-3. Ansari's visit "will build on diplomatic gains" from the India-Africa summit and "we have chosen these two countries as they are great examples of democracy", Secretary (Economic Relations) in the MEA Amar Sinha had said. The King of Morocco had set the ball rolling when he came here in October, Sinha said. The New Delhi Summit -- of which Morocco's King Mohammed VI was the first confirmed guest -- was the largest political conference in modern history connecting Indian and African leaders. He said it is the first high-level visit to the African country after Prime Minister Atal Bihari Vajpayee went there in 1999. "At the level of Vice President the visit comes after 50 years," he had said, noting that it is the 50th year of Morocco's independence. "Hello Africa, Tell me how are you doing?" will be India's motto for the continent, he had said, adding, there will be a series of visits by Indian leaders to Africa in the coming days. The two countries are important for India as it shares economic relations with them and the visit will help in building contemporary relationship between these two countries and India. Both the countries are looking forward to the visit as they are key partners in food security and fertilisers and investments in private sector. "Our car and truck manufacturers are looking at prospective markets," he said. While Morocco's trade with India is "substantial", there is scope for increasing it with Tunisia. "Morocco is a developing destination for Indian film industry," he said. The visit to Morocco intends to further strengthen cordial relations between the two countries, develop and diversify profile of bilateral economic cooperation and explore new avenues of cooperation and partnership on a wide range of issues of shared common interest, the MEA said. The Vice President would hold discussions in Rabat with King Mohammed VI and Prime Minister Benkirane. Speakers of both Houses of Moroccan Parliament and the Minister of Foreign Affairs and Cooperation would call on Ansari who would also visit the city of Marrakesh where he would be hosted by the Governor. The Vice President would meet leading intellectuals and Imams of Morocco as well as deliver a talk at Mohammed University in Rabat. Members of Indian Diaspora will also interact with the Vice President in the Moroccan capital. Ansari will later head to Tunisia, with which India has cordial bilateral relations, for his June 2-3 visit at the invitation of Prime Minister Habib Essid. During this visit, further avenues of cooperation in various areas of growth would be discussed. "The economic cooperation between the two countries is deepening with Indian investments in phosphate sector," the MEA said. The Vice President will hold discussions in Tunis with Essid and President Beji Caid Essebsi on a wide range of issues. He would be received by the president of the Assembly of the Representatives of the People of Tunisia where he would be meeting multi-party Members of Parliament and Tunisian-India Parliamentary Group. Ansari would deliver a keynote address to the Tunisian Diplomatic Corps and leading scholars and think tanks at the Tunisian Institute for Strategic Studies. 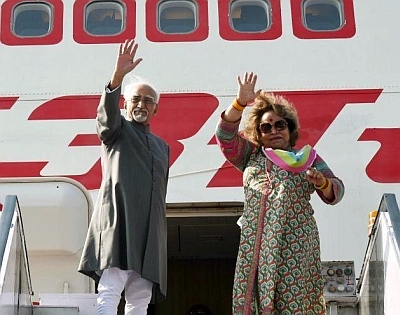 Besides his wife Salma Ansari, the Vice President is accompanied by Minister of State for Chemicals and Fertilizers Hansraj Gangaram Ahir, four members of Parliament and senior officials. The Vice President would return to the national capital on the morning of June 4.